Outside back Luke Morahan and forwards Ben McCalman and Toby Smith will be new faces on the Wallabies' bench for Saturday's second rugby test against England. Coach Michael Cheika on Friday trimmed his extended bench by three players, cutting forwards James Horwill, a former Australia captain, Liam Gill and Wycliff Palu. That leaves Australia with a 5-3 split of forwards and backs on the bench after going into its 39-28 loss in the first test in Brisbane with a 6-2 split. 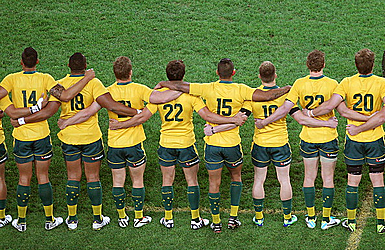 Australia: Israel Folau, Dane Haylett-Petty, Tevita Kuridrani, Samu Kerevi, Rob Horne, Bernard Foley, Nick Phipps, Sean McMahon, Michael Hooper, Scott Fardy, Rory Arnold, Sam Carter, Sekope Kepu, Stephen Moore (captain), James Slipper. Reserves: Tatafu Polota-Nau, Toby Smith, Greg Holmes, Dean Mumm, Ben McCalman, Nick Frisby, Christian Lealiifano, Luke Morahan.